Concerned Veterans for America (CVA), one of the two organizations sponsoring a June 24 conference and rally at Fair Oaks, Virginia to show support for the now doubled number of veterans waiting over 90 days for promised medical care, announced a new $100,000 digital video ad campaign called “Zero” which describes how little the Obama Veterans Administration has been accountable in the now one year old scandal where former American servicemen have been kept waiting – many suffering pain the entire time and some dying during the wait – while the VA covered up the long wait times. The weeknight mini-conference will be addressed by two veterans pushing for VA accountability including CVA’s Dan Caldwell, a former Marine war veteran. Attendance is free with a suggested donation of $5 at the door but a requirement for an advance RSVP click HERE. The early bird dinner discount has been extended one more day to expire Tuesday nite, 6/16 at 11 PM. “Zero” is the title of the new CVA web video with a goal of $100,000 spending plus distribution from sympathetic friends and supporters such as the attendees at the Freedom Leadership Conference, which is also sponsored this month by Uniformed Services League. 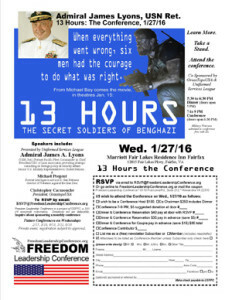 Dr. Johnny L. Simpson, Jr., who has worked with veterans fighting for medical care and support promised to them by the Obama VA, will be the other principal speaker at the June 24 conference. 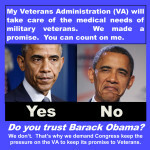 Concerned Veterans for America’s new web video and its sponsorship of the Freedom Leadership Conference on June 24 are designed to highlight the failures of the Obama VA and the need for Americans to demand passage of the VA Accountability Act, HR. 1994 in the House of Representatives and S. 1082 in the US. Senate. The new video comes on the eve of the Conference where CVA’s speaker, Dan Cadwell, a former Marine war veteran, will call for public support for passage of the legislation which will hold the Obama VA accountable. Dan Caldwell (L) for Concerned Veterans for America and Dr. Johnny L. Simpson, Jr. (R) for Uniformed Services League, headline June 24 conference their organizations are sponsoring. The VA Accountability Act, a bill introduced by House Veterans Affairs Committee Chairman Jeff Miller, would empower the VA secretary to quickly remove any VA employee, not just senior executives, misconduct or poor performance while also protecting whistleblowers. The current process for removal often leaves VA employees guilty of misconduct on paid administrative leave for months and sometimes years. “One year after the VA wait list scandal first came to light, zero people have been fired for manipulating patient wait time data at VA hospitals. It is almost universally recognized that the Department of Veterans Affairs has an infected, toxic culture, but if there is no accountability or consequence for misconduct, that culture is never going to change, and veterans aren’t going to get the timely, quality medical care they earned and deserve. In spring of 2014 it was revealed that the majority of VA hospitals around the country manipulated wait time data and placed veterans on secret waiting lists to give the appearance of shorter wait times—all while denying veterans access to timely medical care. In some cases, veterans died waiting to receive medical care. VA hospital officials, however, pocketed bonuses for what appeared on paper to be improving wait times at VA facilities across the country. 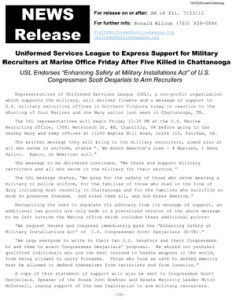 (the preceding four paragraphs are from the Concerned Veterans for America website, while other parts of this story were provided by the other 6/24 conference sponsor, Uniformed Services League).